Beautiful midnight blue, blue goldstone is a synthetic stone with sparkling metal stars in it that look fantastic when they catch the light, Always reminds me of a cloudless starry night. 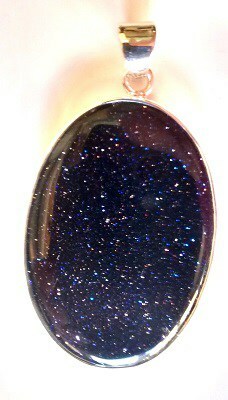 This is a fantastic pendant. The oval flat cabochon measures 35mm x 25mm and is simply set in silver and sold on a FREE eighteen inch sterling silver chain.